At Steel Bridge Coffee there are two primary components to our environmental stewardship that you will notice: bicycle delivery and reusable containers. We deliver coffee by bicycle partly because we love riding bikes but also because it saves a valuable finite resource (petroleum) and reduces our contribution to greenhouse gases in the atmosphere. Also we package your whole bean coffee in glass jars because it reduces the amount of trash that winds up in landfills and saves energy used to recycle materials. We believe that this approach makes good, simple sense; we hope you agree. It's important to understand that the bicycle-delivery component to our business grew out of the owner's love for bicycles and six years of four season bicycle commuting. Therefore should you at some point look out your window on a blustery Oregon day and feel guilty about some poor bicyclist getting drenched and dirty for the sake of your indulgent morning coffee ritual, know that said bicyclist is doing what he loves and experiencing great self-fulfillment. Also know that he understands the importance of indulging in great coffee each morning. To our knowledge it is not possible to recycle most coffee packaging materials. Paper coffee bags are usually coated on the inside with a kind of plastic or metal film, which improves coffee storage but renders the packaging difficult to recycle. They are, however, good candidates for upcycling into homemade wallets. If you have old coffee bags that you don't know what to do with, try turning it into something useful, or donate it to Steel Bridge Coffee to turn it into a wallet. But beware, the world only needs so many wallets; it's better to buy coffee in glass jars that get reused for years and can always be recycled if they ever get damaged. 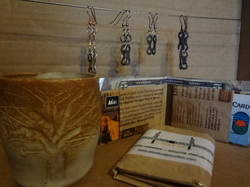 We also like to upcycle used bicycle chains into awesome earrings.